Just an hour before Officer Dale Woods was hit by a vehicle while working at the scene of a Jan. 4 crash, he'd received thanks from a father for breaking a window to save a baby inside a hot car. A few months earlier, Woods ran into a burning building to save a blind woman. And as a new cop, he once chased a suspect from a murder scene by himself, Police Chief Mark Denney said during a service at Xavier University’s Cintas Center Monday. Denney was one of many members of the community who came together Monday to pay respect to the Colerain police officer who died Jan. 7 at the hospital. COLERAIN TOWNSHIP, Ohio — Just an hour before Officer Dale Woods was hit by a vehicle while working at the scene of a Jan. 4 crash, he'd received thanks from a father for breaking a window to save a baby inside a hot car. A few months earlier, Woods ran into a burning building to save a blind woman. And as a new cop, he once chased a suspect from a murder scene by himself, Police Chief Mark Denney said during a service at Xavier University’s Cintas Center Monday. Denney was one of many members of the community who came together Monday to pay respect to the Colerain police officer who died Jan. 7 at the hospital. "Dale, I love you and I'm going to miss you," Denney said. "You made me a better person for knowing you. And you made our police department a better police department for being part of us. And I know you made Colerain Township a safer community because you stood the watch." It was a "tragic" and "unfair" death for the man who endeared himself to so many people in his life, Denney said. He recalled Woods as "a hero." "And being a hero doesn't require that you die in a fiery explosion or you have an innate ability for carrying a football or a tune," he said. "But it does require you be willing to give everything, including your life, for a purpose greater than yourself." On the force, Woods was a natural who treated people with respect and remained calm under pressure; "a cop's cop," Denney said. "It tells the rest of us, as police officers, basically everything we need to know," he said. "It tells us, when we make that traffic stop at 2 in the morning, that he'll be on the other side of the car looking for the gun. When we go to that domestic, he'll be standing right next to us." Denney also said Woods was the kind of friend "you never doubted." "He had a remarkable ability for gaining friendships and earning respect without having to say very much," Denney said. Addressing Woods' children, Denney said Woods loved and was "incredibly proud" of them. "He left you with a remarkable legacy," he said. "He's also left you with thousands of new aunts and uncles." Following the service, police officers escorted Woods’ body to Spring Grove Cemetery. First responders saluted or placed their hands over their hearts as Woods passed. People who were driving by stopped and got out of their cars to watch the procession. "It's a brotherhood," Melbourne, Kentucky, volunteer firefighter Chris Cummins said. He grew up in Colerain and met Woods several times. "It doesn't matter if you're police, fire — when you lose somebody, we all come together." Public and private services were also held over the weekend; officers escorted Woods on Saturday to some of his favorite places, including the Clovernook Country Club in North College Hill, where Woods was an avid golfer. People across the city braved the snow and cold, lining the street with flags to honor Woods’ service. The procession also traveled to Colerain High School, where community members attended a public visitation. 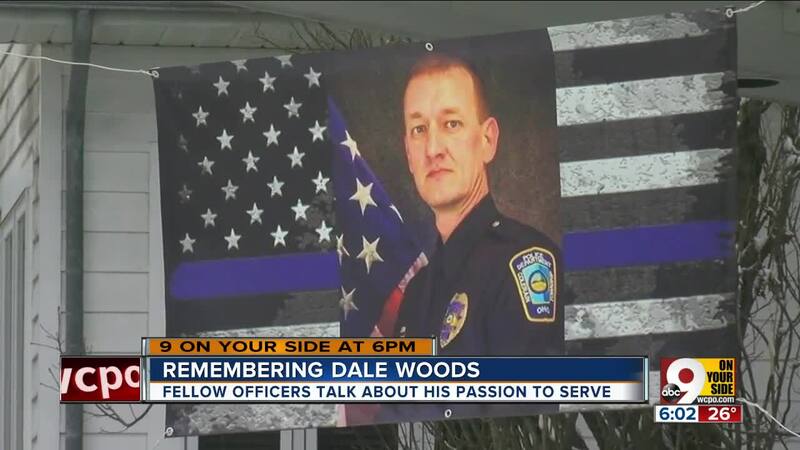 Officer Woods’ family and colleagues also held private vistations over the weekend. 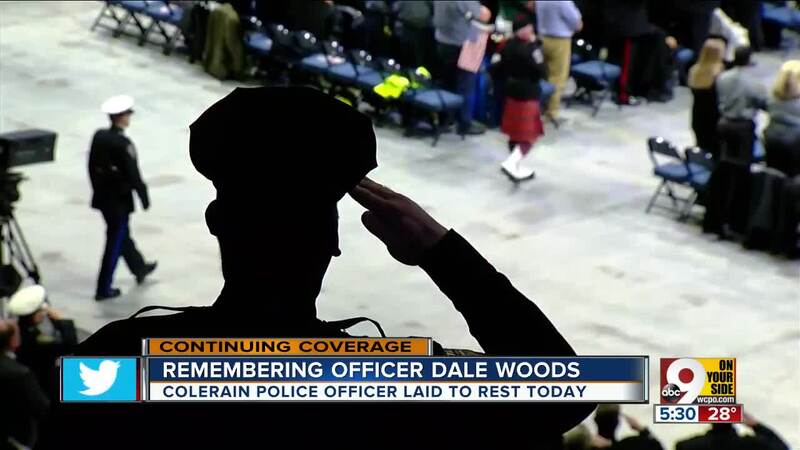 Colerain Township officers mourned their colleague at the police department, and the Fraternal Order of Police held a memorial service Sunday night at Spring Grove Cemetery.